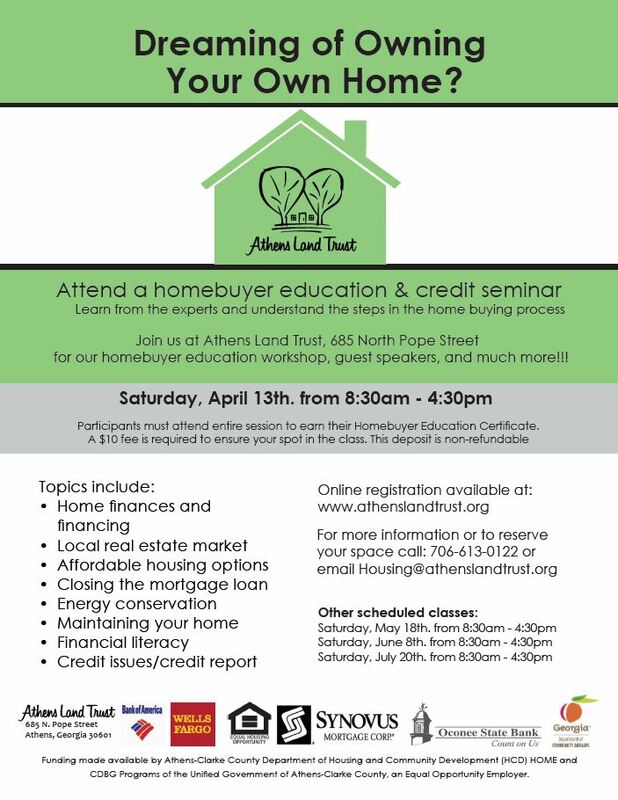 Registration for the April Homebuyer Education Class is now closed. To sign up for our Homebuyer Education Class, complete the following two steps: 1) Registration and 2) Payment. To Register online, please fill out the electronic form below. Fields with a red * are mandatory and must be filled in to complete the registration form. Click Submit and continue to step 2 for payment options. Paper applications can be downloaded online, picked up at the Athens Land Trust office or mailed to you at your request. To request an application by mail, please call 706-613-0122. To Download an application, click Download Registration Form and continue to step 2 for payment options. Completed forms can be dropped off or mailed to the Athens Land Trust office located at 685 N. Pope St., Athens, Ga 30601. If the registration form below does not display, click here to complete the registration form online. A $10 per person payment is required to ensure your spot in the class. This payment is non-refundable, and you are not completely registered until you have completed the payment. If you are unable to afford this payment, please contact Housing Counseling at housing@athenslandtrust.org to discuss scholarship options. Acceptable forms of payment include check, cash, money order, or Credit/Debit Card using the online payment method. To pay online click, Make an Online Payment. Payments can be made in person or mailed to 685 N. Pope St., Athens, Ga 30601. Looking for a homebuyer education course where you can move at your own pace? The University of Georgia Extension offers homebuyer education courses that are available online. Click the link below to learn more.